Copenhagen, May 1st 2018 – Ross DK has signed a collaboration agreement with Ardent Oil. 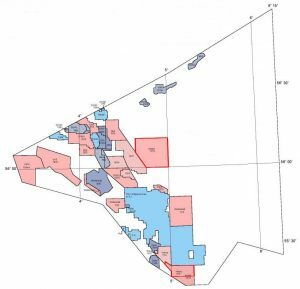 Ardent Oil is the operator of licence 11/16 ‘Jarnsaxa’ which covers blocks 5604/27, 5604/28, 5604/31 and 5604/32 and licence 10/16 ‘Laufey’ which covers blocks 5504/20, 5504/24 and 5505/21 in the Danish part of the North Sea. The collaboration agreement is focused on supplementing Ardent Oil with resources and knowledge for drilling and operations in the Danish part of North Sea. Ross DK has accumulated a significant amount of data on all aspects of field development, exploration well management and analysis and recommendations on new field development. Bob Moore, CEO of Ardent Oil said; “We have signed a collaboration agreement with Ross DK to enable us to deliver timely drilling campaigns in Denmark which is a core area for the company. The collaboration covers preparation for drilling our Denmark licences, in particular, our exciting and high impact ‘Jarnsaxa’ exploration prospect on licence 11/16. As we move through the project plan we will jointly discuss, risk manage and develop plans towards a successful drilling campaign”. The agreement is focussed making informed drilling decisions in the project process. Ardent Oil was founded in April 2013 as a privately financed oil & gas exploration company based in London and we hold exploration licences in the UK and Danish sectors of the North Sea. In our Denmark licences Ardent Oil holds an 80% licence interest with Nordsøfonden holding the remaining 20% licence interest.